As we make our way out of summer and into the fall, there’s no better place to be than outside in your own backyard, enjoying the crisp air and the seasonal yellows, reds, and oranges of the changing leaves. Unfortunately, with the picturesque fall days also come shorter, darker evenings. Rather than retreating indoors until spring, though, many folks will take the opportunity to spend the last few warm evenings out in their yards – enjoying time with family and friends at BBQs, cookouts and more – highlighting the beauty of the season with the attractive ambiance of outdoor landscape hardscape lighting. Aesthetics and accents. 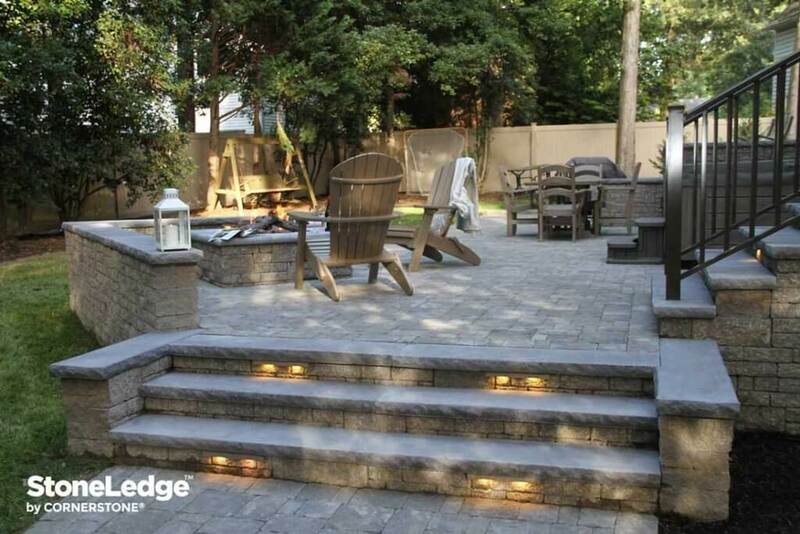 Landscape lighting is a great way to highlight some of your favourite backyard features! 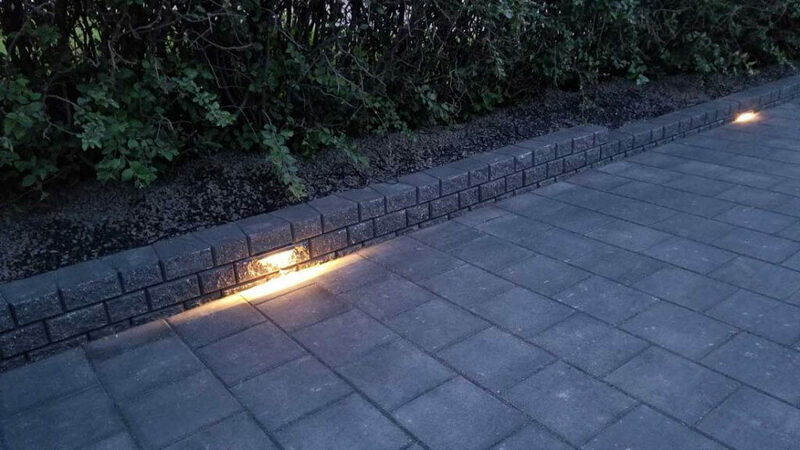 Lights can be installed to illuminate pathways, easily fixed into retaining walls and steps for dramatic effect, and used to spotlight trees or other natural features on your property. Safety. In addition to beautifying your outdoor space, landscape lighting also enhances the safety of your backyard, illuminating potential hazards such as stairs, pillars, and hardscape fountains, saving you or one of your guests from a fall – or an unintended swim! Security. Landscape lighting also has the added benefit of deterring any trespassers from spending time on your property – a well-lit yard is a more secure yard. Landscape lighting is a great way to make your backyard somewhere truly special to spend time – regardless of whether it’s summer or fall, day or night! More than that, you can bring this unique ambiance to your own outdoor space with relative ease – particularly if you pair your plans with some unique hardscape products. Plan ahead. 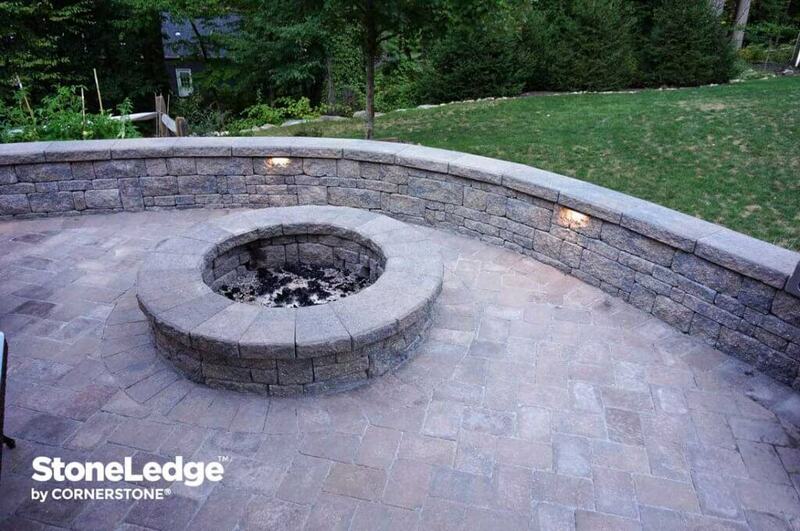 The best time to install outdoor lighting is in tandem with other landscaping work that you’re planning. 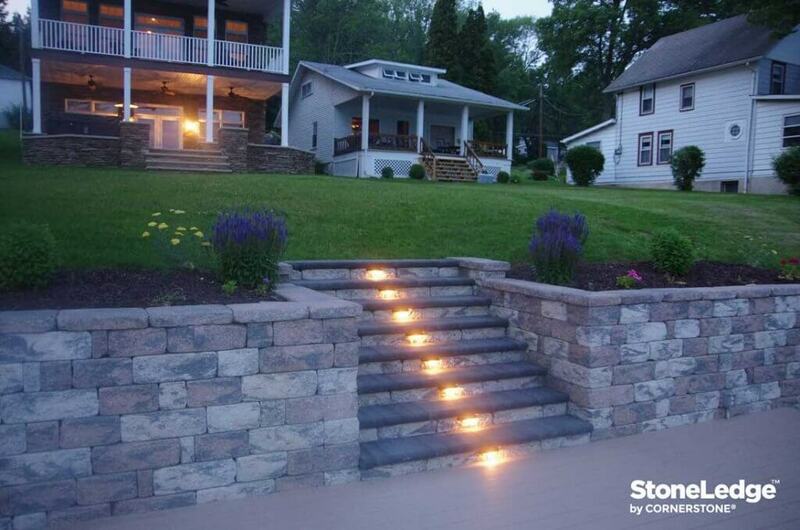 If you’re considering a landscape hardscape project , or are looking at installing a set of landscape stairs, for example, there’s no better time to look into landscape lighting as well. Do things by the book. When it comes to landscape lighting, it’s important to go through all the proper motions ahead of time. Contact your local municipal government about any lighting bylaws you should know about, ensure all electrical requirements are met, and make sure you get any permits you might need to keep the installation above-board and on-track. Make it easy with CornerStone. Once you’ve got all your ducks in a row, make sure the job goes as smoothly as possible by integrating your landscape hardscape lighting plans with our specialized lineup of CornerStone products. 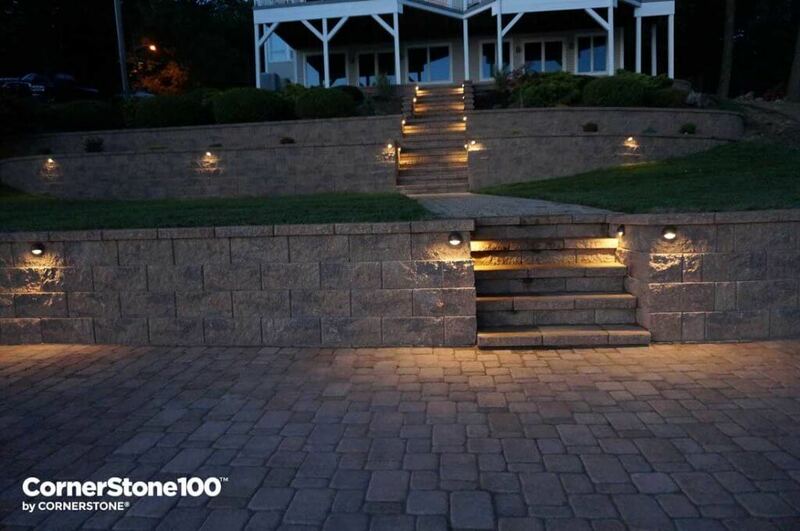 Our MiraStone and CornerStone 100 systems are both ideal candidates to pair with landscape lighting – their hollow core design makes any necessary lifting, cutting and wiring a breeze! Selecting the right lights. Choosing the type of lights can be a difficult process. With hundreds upon hundreds of lights to choose from, it’s important to keep your space lit properly. Whether adding spotlights on trees, hardscape lights on walls or steps, in-ground lights in flower gardens, or highlighting pillars, there’s no limit to improving the atmosphere in your yard. For more ideas on finding the right light for you, check out lunarscapelighting.com. Don’t let the shorter days and changing seasons limit the time you spend in your backyard – enjoy the crisp autumn evenings with friends and family in your own beautifully lit outdoor space. Discover the splendour and utility that landscape lighting can bring to your backyard, and visit any one of our authorised re-sellers to learn just how easy it is to integrate ambient, atmospheric lighting into your next hardscaping project.